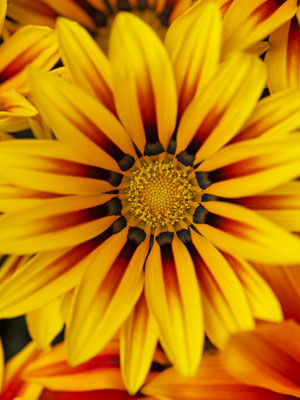 Pair gazanias with taller drought-tolerant flowers such as gomphrena and coreopsis. If you prefer a low-growing composition, soften the coarse texture of gazanias with companionable mounds of portulaca. When starting gazania seeds indoors in early spring, cover them well with moist seed starting mix. Gazanias also can be direct-sown in spring, after the soil has warmed. Blossoms open during the day and close at night, so they are not useful as cut flowers. Container-grown plants can be brought indoors in autumn and kept growing in a sunny windowsill or greenhouse.